Apistogramma megastoma dominant male guarding his territory. 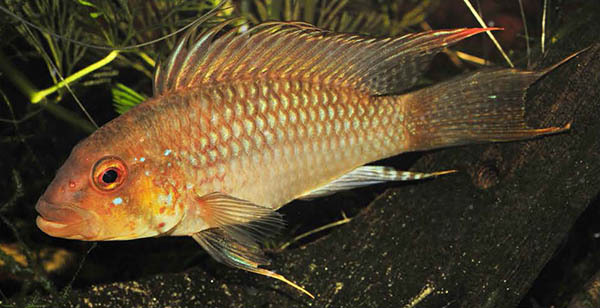 This Peruvian discovery is a dwarf maternal mouthbrooder with excellent potential to become an aquarium favorite. All Images: Romer et al. Mouthbrooding is not a behavior most aquarists would attribute to dwarf cichlids of the genus Apistogramma, which makes it all the more interesting to attempt keeping an Apistogramma that bucks the trend. Possibly in the hobby as early as 1999, Apistogramma sp. 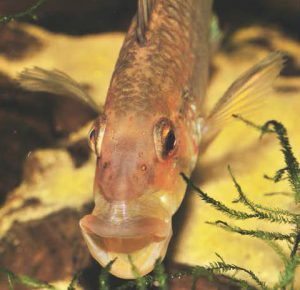 “Mouthbrooder/Maulbruter” is a facultative biparental mouthbrooder that initially stood out singularly among the genus; it was described as Apistogramma barlowi in 2008. But aquarists have long known of a second mouthbrooding species, in the hobby and trade as Apistogramma sp. “Kelleri,” although in the past researchers dismissed this hypothesis and considered A. sp. “Kelleri” to simply be A. barlowi. 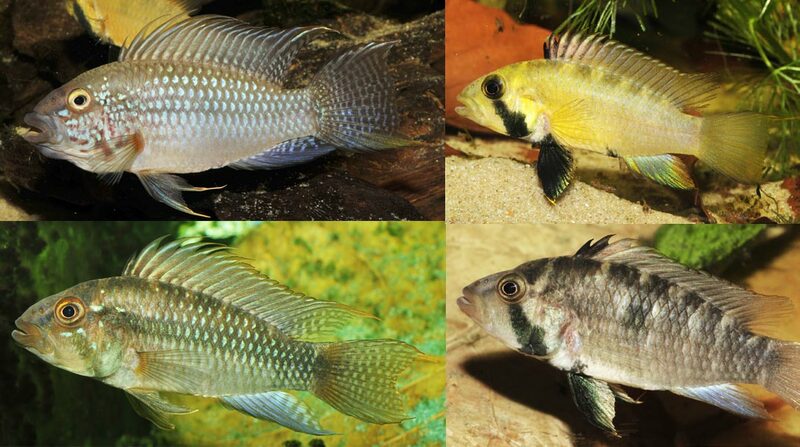 Examples of males (left column) and females of the newly described Apistogramma, previously known as as Apistogramma sp. “Kelleri”. Male threat display showing the extreme size of its mouth. In true scientific fashion, the hypothesis has been reexamined, new evidence revealed, and past opinions and conclusions have changed. 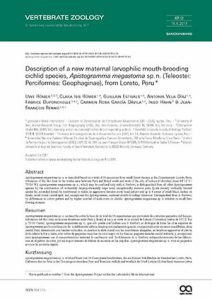 As a result, the open access journal article, “Description of a new maternal larvophilic mouth-brooding cichlid species, Apistogramma megastoma sp. n. (Teleostei: Perciformes: Geophaginae), from Loreto, Peru,” by authors Uwe Römer, Clara Isis Römer, Guillain Estivals, Antonia Vela Diaz, Fabrice Duponchelle, Carmen Rosa García Dávila, Ingo Hahn, and Jean-François Renno, was published in the May 15th, 2017, pre-release of VERTEBRATE ZOOLOGY – 67 (2) 2017. Reconciling collection location information published for Apistogramma sp. “Kelleri” with the information provided in the new species description, it is safe to conclude that A. sp. “Kelleri” is now newly-described as Apistogramma megastoma, and has joined A. barlowi as the second recognized mouthbrooding Apistogramma species. The differences separating these two closely-related species are laid out in the new article, but perhaps most notable is the observation that unlike A. barlowi (and in contrast to prior reports as A. sp. “Kelleri” ), A. megastoma males do not appear to practice facultative mouthbrooding. In short, the researchers have concluded that A. megastoma is exclusively a maternal mouthbrooder. Other differences include differences in general behavior, and subtle coloration clues that could be used to differentiate the species when viewed side-by-side. Male threat display, showing teeth and impressive gape. As an aquarium specimen, Apistogramma megastoma offers a unique set of behaviors within the genus, not to mention a wide range of socially- and behaviorally-driven coloration shifts as documented by Römer et. al. For more information, download and read the full species description and share your experiences with this species in the comments below. Comments may be used in a future AMAZONAS article about these species. Apistogramma megastoma sp. n. is described based on a total of 18 specimens from small forest streams in the Departamento Loreto, Peru, tributaries of the Río Jutai in the border area between Peru and Brazil south and west of the city of Leticia (Colombia) (near 04°12′ S / 70°06′ W). Apistogramma megastoma sp. 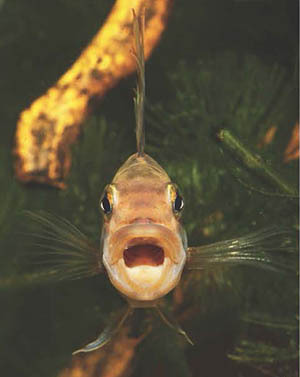 n., which may be confused only with A. barlowi, is distinguished from all other Apistogramma species by the combination of: noticeably disproportionately large head; exceptionally massive jaws, lyrate densely vertically banded caudal fin, extended dorsal-fin membranes in males; in aggressive females sooty head pattern and up to 8 series of small black dashes on flanks; small round caudal spot; and, exceptional for Apistogramma, maternal mouth-brooding behaviour. Distinguished from A. barlowi, by differences in colour pattern and by higher number of scale rows on cheeks. Apistogramma megastoma sp. n. inhabits in small fastflowing streams.